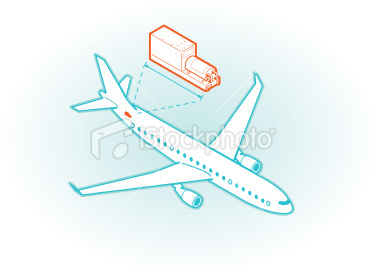 The "black box" is a generic term for two recording devices carried aboard commercial airliners. The Flight Data Recorder (FDR) records a variety of parameters related to the operation and flight characteristics of the plane. The Cockpit Voice Recorder (CVR) records the voices of the flight crew, engine noise, and any other sounds in the cockpit. All large commercial airliners and certain varieties of smaller commercial, corporate, and private aircraft are required by law to carry one or both of these boxes, which generally cost between $10,000 and $15,000 apiece. The data these devices provide is often invaluable to experts investigating the events leading up to an accident. The recovery of the boxes is one of the highest priorities in any mishap investigation, second only to locating survivors or recovering the remains of victims. FDR information is also often used to study other aviation safety issues, engine performance, and to identify potential maintenance issues. Despite the nickname "black box," the FDR and CVR are actually painted a bright high-visibility orange with white reflecting strips to make them easier to spot at a crash scene. The meaning of the term black box itself is somewhat unclear. Some suggest it refers to the black charring that occurs in a post-crash fire while others believe the color black is a reference to the deaths often associated with an accident investigation. The design of modern black boxes is regulated by a group called the International Civil Aviation Organization (ICAO). The ICAO determines what information the black boxes must record, over what length of time it is saved, and how survivable the boxes must be. The ICAO delegates much of this responsibility to the European Organisation for Civil Aviation Equipment (EUROCAE) that maintains a document called the Minimum Operational Performance Specification for Crash Protected Airborne Recorder Systems. Black boxes first began to appear in the 1950s and became mandatory during the 1960s. 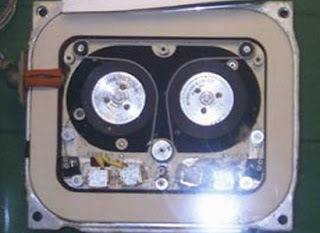 These early devices used magnetic tape for data storage, much like that used in a tape recorder. As the tape is pulled over an electromagnetic head, sound or numerical data is recorded on the medium. Analog black boxes using magnetic tape are still present aboard many planes, but these recording devices are no longer manufactured. Newer recorders instead use solid-state memory boards, called a Crash Survivable Memory Unit (CSMU), that record data in a digital format. Instead of the moving parts present in older recorders, solid-state devices use stacked arrays of memory chips similar to a USB memory stick. The lack of moving parts eases maintenance while reducing the chance of a critical component breaking in a crash. Solid-state recorders can also save considerably more data than older magnetic tape devices and are more resistant to shock, vibration, and moisture. Whatever the medium used to record the data, the purpose of the black boxes is to collect information from various sensors aboard an aircraft. 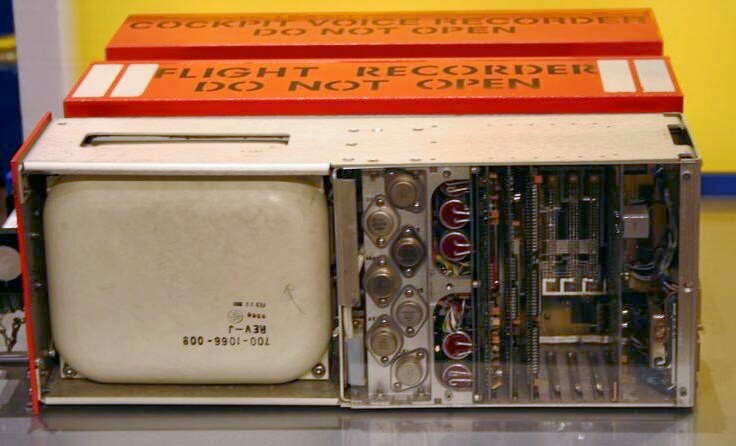 The Cockpit Voice Recorder, for example, saves sounds from microphones located on the flight deck. An area microphone is typically placed in the overhead instrument panel between the pilots, and an additional microphone is located in the headset of each member of the flight crew. These microphones pick up conversations between the flight crew, engine noises, audible warning alarms, landing gear sounds, clicks from moving switches, and any other noises like pops or thuds that might occur in the cockpit. The CVR also records communications with Air Traffic Control, automated radio weather briefings, and conversations between the pilots and ground or cabin crew. These sounds often allow investigators to determine the time of key events and system failures. Analog magnetic tape recorders are required to store four audio channels for at least 30 minutes while digital solid-state devices are required to record for two hours. Both types use continuous recording such that older information is written over as new data is collected beyond the maximum time limit. 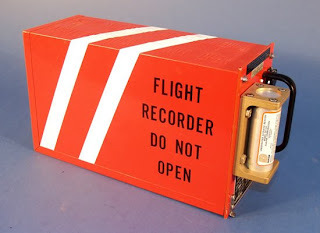 The Flight Data Recorder collects data from a number of sensors to monitor information like accelerations, airspeed, altitude, heading, attitudes, cockpit control positions, thermometers, engine gauges, fuel flow, control surface positions, autopilot status, switch positions, and a variety of other parameters. Most parameters are recorded a few times per second but some FDRs can record bursts of data at higher frequencies when inputs are changing rapidly. 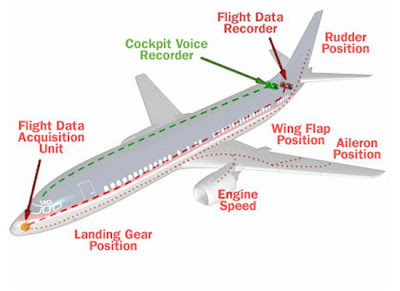 The data measured by the different sensors is collected by the Flight Data Acquisition Unit (FDAU). This device is typically located in an equipment bay at the front of the aircraft beneath the flight deck. The FDAU assembles the desired information in the proper format and passes it on to the FDR at the rear of the plane for recording. 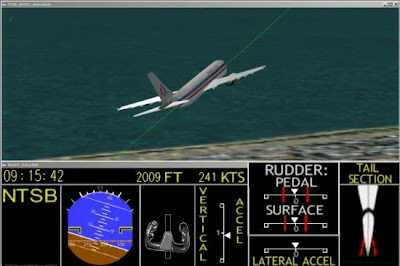 The Federal Aviation Administration (FAA) required the FDR to record between 11 and 29 parameters, depending on aircraft size, up to 2002 but now requires saving a minimum of 88 sets of data. Analog FDRs can save a maximum of around 100 variables while digital recorders are often capable of collecting over 1,000 parameters over the course of 25 hours. Power for the black boxes is provided by electrical generators connected to the engines. The generators on most large airliners produce a standard output of 115 volt, 400 hertz AC power while some smaller planes instead generate 28 volt DC power. Black boxes are typically designed to use only AC or DC power but not either one. Recorders built for compatibility with the AC power supplies on larger planes cannot be used on small DC-powered aircraft. 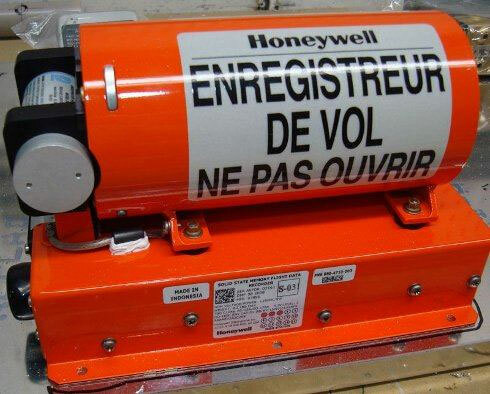 In the event of engine failure, larger aircraft are also equipped with emergency backup power sources like the auxiliary power generator and ram air turbine to continue operating the black boxes. In addition, the ICAO is considering making a battery mandatory on solid-state recorders to provide an independent power supply in the event of a complete power failure aboard the plane. A common misconception states that the black boxes are "indestructible." No manmade device is indestructible, and no material has ever been developed that cannot be destroyed under severe enough conditions. The black boxes are instead designed to be highly survivable in a crash. 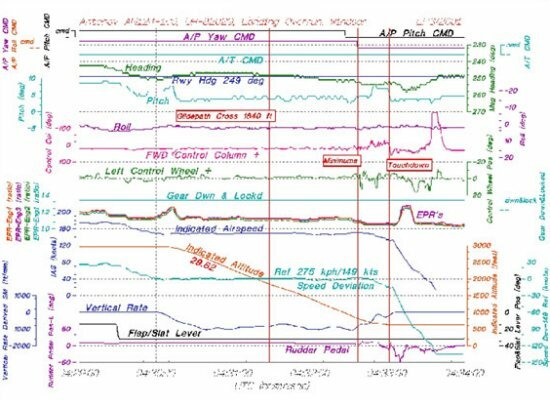 In many of the worst aviation accidents, the only devices to survive in working order are the Crash Survivable Memory Units (CSMUs) in the black boxes. The remainder of the recorders, including the external case and other internal components, are often heavily damaged. The CSMU, however, is contained within a very compact cylindrical or rectangular box designed to safeguard the data within against extreme conditions. The box is composed of three layers to provide different types of protection to the recording medium. The outermost shell is a case made of hardened steel or titanium designed to survive intense impact and pressure damage. The second layer is an insulation box while the third is a thermal block to protect against severe fire and heat. Together, these three layered cases allow the FDR and CVR to survive in all but the most extreme crash conditions. Current regulations require the black boxes to survive an impact of 3,400 g's for up to 6.5 milliseconds. This rapid deceleration is equivalent to slowing from a speed of 310 miles per hour (500 km/h) to a complete stop in a distance of just 18 inches (45 cm). This requirement is tested by firing the CSMU from an air cannon to demonstrate the device can withstand an impact force at least 3,400 times its own weight. The black boxes must also survive a penetration test during which a steel pin dropped from a height of 10 ft (3 m) impacts the CSMU at its most vulnerable point with a force of 500 pounds (2,225 N). In addition, a static crush test is conducted to demonstrate that all sides of the CSMU can withstand a pressure of 5,000 pounds per square inch (350 kg/cmï¿½) for five minutes. The fire resistance of the CSMU is further tested by exposing it to a temperature of 2,000ï¿½F (1,100ï¿½C) for up to an hour. The device is also required to survive after lying in smoldering wreckage for ten hours at a temperature of 500ï¿½F (260ï¿½C). Other requirements specify survivability limits when immersed in liquids. The CSMU must endure the water pressure found at an ocean depth of 20,000 ft (6,100 m), and a deep-sea submersion test is conducted for 24 hours. Another saltwater submersion test lasting 30 days demonstrates both the survivability of the CSMU and the function of an Underwater Locator Beacon (ULB), or "pinger," that emits an ultrasonic signal once a second when immersed in water. These signals can be transmitted as deep 14,000 ft (4,270 m) and are detectable by sonar to help locate the recorders. A final series of tests includes submerging the CSMU in various fluids like jet fuel and fire extinguishing chemicals to verify the device can withstand the corrosive effects of such liquids. Upon completion of the testing, the black boxes are disassembled and the CSMU boards are extracted. The boards are then reassembled in a new case and attached to a readout system to verify that the pre-recorded data written to the device can still be read and processed. 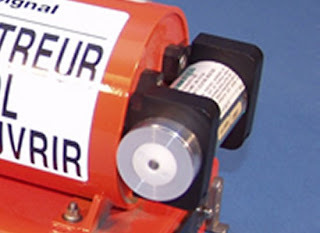 Another factor important to the survivability of the black boxes is their installation in the tail of the aircraft. The exact location often varies depending on the plane, but the FDR and CVR are usually placed near the galley, in the aft cargo hold, or in the tail cone. The recorders are stored in the tail since this is usually the last part of the aircraft to impact in an accident. The entire front portion of the plane acts like a crush zone that helps to decelerate the tail more slowly. This effect reduces the shock experienced by the recorders and helps to cushion the devices to improve their chances of surviving the crash. Once the black boxes have been located following an accident, they are typically taken into custody by an aviation safety agency for analysis. In the United States, responsibility for investigating most air accidents belongs to the National Transportation Safety Board (NTSB). Many countries lacking the capability to analyze black boxes also send their recorders to the computer labs of the NTSB or some of the better-equipped investigative organizations in Western nations. Care must be taken in recovering and transporting the recorders so that no further damage is done to the devices that might prevent important data from being extracted. 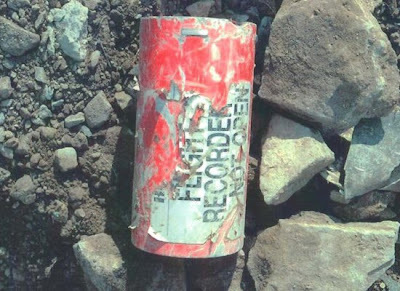 Upon receipt of the recorders, the NTSB uses a series of computer and audio equipment to process and analyze any information that can be recovered. The data is translated into formats readily usable by investigators and is usually critical in identifying the probable cause(s) of the accident. This process may take many weeks or months depending on the condition of the black boxes and the level of processing required to make sense of the data. 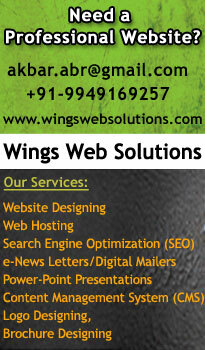 Outside experts are also often consulted to help analyze and interpret the data. Flight Data Recorder information is typically presented in the form of graphs or animations used to understand instrument readings, flight characteristics, and the performance of the aircraft during its final moments. Cockpit Voice Recorder information is usually more sensitive and laws strictly regulate how it is handled. A committee including representatives of the NTSB, FAA, the airline, the manufacturers of the aircraft and engines, and the pilots union is responsible for preparing a transcript of the CVR's contents. This transcript is painstakingly created using air traffic control logs and sound spectrum analysis software to provide exact timing. Although the transcript can be released to the public, only select and pertinent portions of the actual audio recording are made public due to privacy concerns. 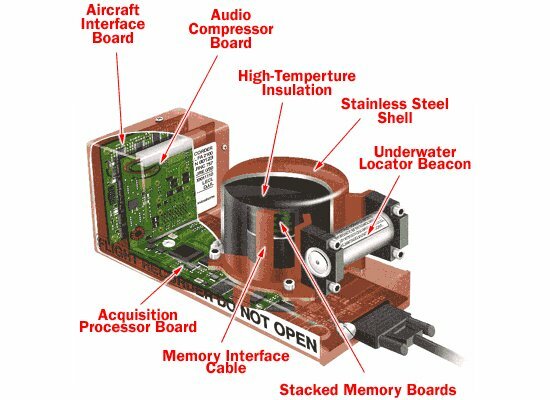 Flight recorder design has improved considerably since the devices were first introduced in the 1950s. However, no recording device is perfect. 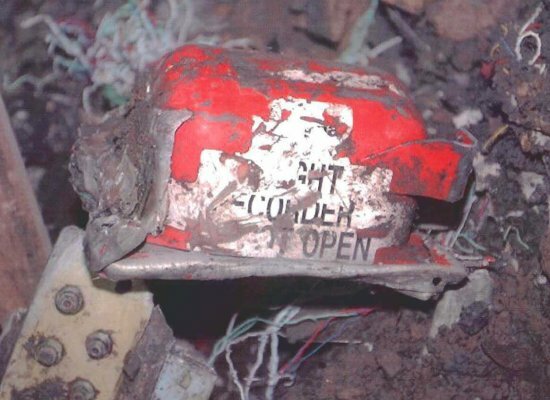 Black boxes are sometimes never found or too badly damaged to recover some or all of the data from a crash. To reduce the likelihood of damage or loss, some more recent designs are self-ejecting and use the energy of impact to separate themselves from the aircraft. Loss of electrical power is also a common event in aviation accicents, such as Swissair Flight 111 when the black boxes were inoperative for the last six minutes of flight due to aircraft power failure. Several safety organizations have recommended providing the recorders with a backup battery to operate the devices for up to ten minutes if power is interrupted. Another recommendation is to add a second independent set of recorders on a separate electrical bus to insure redundancy in the event of a system failure. The additional recorders would be located as close to the cockpit as possible while the existing black boxes remain in the tail to reduce the likelihood of a single failure incapacitating both sets. Accident investigators have also argued for the installation of a third black box to record cockpit video. Though pilots have so far resisted the move because of privacy issues, video data would be useful to better understand pilot actions in the moments leading up to an accident.